The Melbourne Ageing Research Collaboration (MARC) would like to invite you to attend Creating ageing and aged care research opportunities using Australian datasets workshop on Friday, 20 July 2018. Do you want to develop more skills in enabling engagement of people living with dementia in activities, touchscreen, technology or reminiscence? The Academic Unit for Psychiatry of Old Age, Department of Psychiatry, are holding one-day workshops for health professionals, diversional therapists, lifestyle staff and care workers working in acute, sub-acute, community and residential aged care settings. The workshops focus on tailoring engagement to better meet the person with dementia’s needs, interests and abilities. Using activities to enable and care for people living with dementia who experience BPSD workshop – Monday 30 July and Friday 12 October 2018. Using Apps to enable engagement for people living with dementia workshop – Friday 9November 2018. Reminiscing with people living with dementia workshop – Monday 12November and Monday 10December 2018. 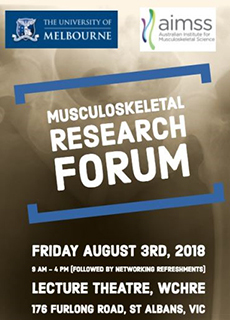 The inaugural Musculoskeletal Research Forum, the Department of Medicine, Western Health and the Australian Institute for Musculoskeletal Science (AIMSS), will be held on August 3, 2018. The Department of General Practice is offering professional development and customised non-award programs in August and September. This is a two-day course is aimed at researchers who plan to undertake qualitative research interviews. The course will provide an overview of qualitative research interview principles and practices and is suited to the novice or more experienced researcher. Those interested in the course are likely to be conducting their own qualitative research interviews or looking to expand their knowledge and skills of interview methods. This short course is an introduction into the world of implementation science – the science of translating evidence into practice. Using a mix of presentations, forums and workshops, participants will share information and workshop ideas about how to implement change and how to know you are making a difference. What do clinician scientists do, and how might they succeed in both the clinical and research worlds? 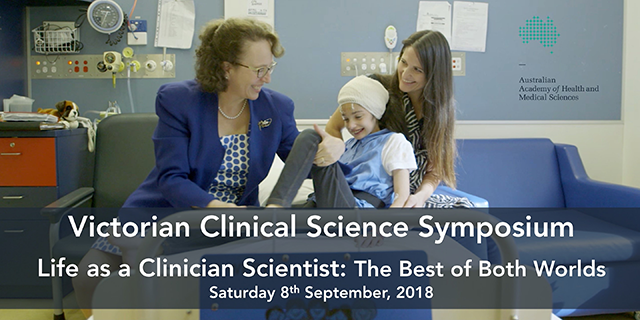 Join medical students, junior doctors and consultants interested in research at a one-day symposium, Life as a Clinician Scientist, at the Melbourne Convention and Exhibition Centre on Saturday, 8 September 2018. Proudly supported by the University of Melbourne, tickets have been significantly subsidised to $20 (full-price $60). Sent on behalf of the Australian Academy of Health and Medical Sciences. The Department of Rural Health is hosting its Fourth Annual Aboriginal and Torres Strait Islander Health Conferenceon Wednesday, 17 October 2018 at the Mercure Ballarat Hotel and Convention Centre, Ballarat. The scientific program features keynote speakers Professor Kerry Arabena and Nova Peris OAM. Professor Tom Calma AO will be our guest speaker at the conference dinner. The program features many other speakers who will share their knowledge of Aboriginal health in Aboriginal hands. The Safer Families Centre of Research Excellence will be holding an International Domestic Violence and Health Conference: Sustainable Change in the Health Sector, on 20-21 November 2018. This conference will host practitioners, survivors, researchers, students, policy makers, community leaders and advocates from all over the world. The focus is on children, young people and their parents and carers, including Aboriginal and Torres Strait Islander communities and other Indigenous peoples. A safe and trauma-informed conference, our program and space will be relevant and respectful to survivors and those working in the domestic violence area. Registrations are now open with early bird rates until August 10, 2018.